Games keep making me buy them, it's horrible I know. Do you also share my dilemma? I grew up playing games like backgammon (probably with the wrong rules) and later when I was a teen I somehow fell into the role of a chess captain at an all girls high school. I wasn't a very good chess player, as I could only see the options available to me after my opponent had moved, and lost pretty much all the games. Losing competition after competition my chess love slowly went into hibernation :) It's such a great game, but unfortunately I wasn't any good at it. But I still loved other abstract games, especially checkers. Then when I came to Japan I saw shogi and thought oooooh this looks like a lot of fun, but wasn't game to try it because I wasn't sure I could play it. After 9? years in Japan, my fantastic students tried to teach me it in mixed Japanese English and it was so much fun even though I couldn't read the kanji or understand all the rules (I think they let me win hehe). Another time a kind older gentleman in the Shogi club at my community center tried to teach it me also. Then just as my world into tabletop board games grew, I started seeing Dobutsu Shogi on the store shelves. Not just game store shelves but in big department? stores like Tokyu Hands (a store that sells a lot of arts & craft/hobby goods, one of my favourite souviner shops in Japan). It took me about a year before I ordered the game. The turning point was in 2013 a Board Game Geek friend overseas asked me to get a copy of it for him, then another gamer asked me. Then there was no turning back :) I knew I had to get a copy. 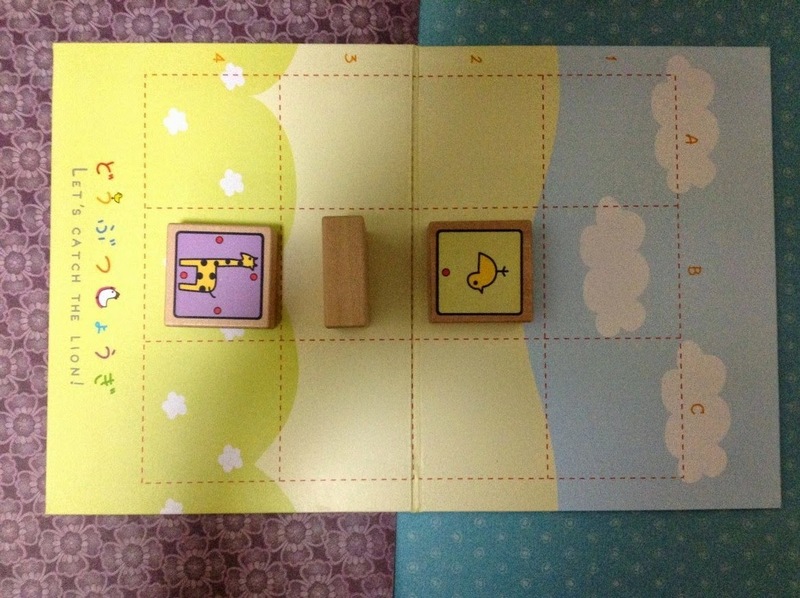 Having played the fun game RRR by Seiji Kanai, Dobutsu Shogi's dots on the pieces reminded me of that. Since I enjoyed RRR quite a bit, I thought Dobutsu Shogi might also fill that abstract niche I like. It's a lot shorter than chess, not as complicated, and the components make it easy to teach. The cute pastel animals also helped. 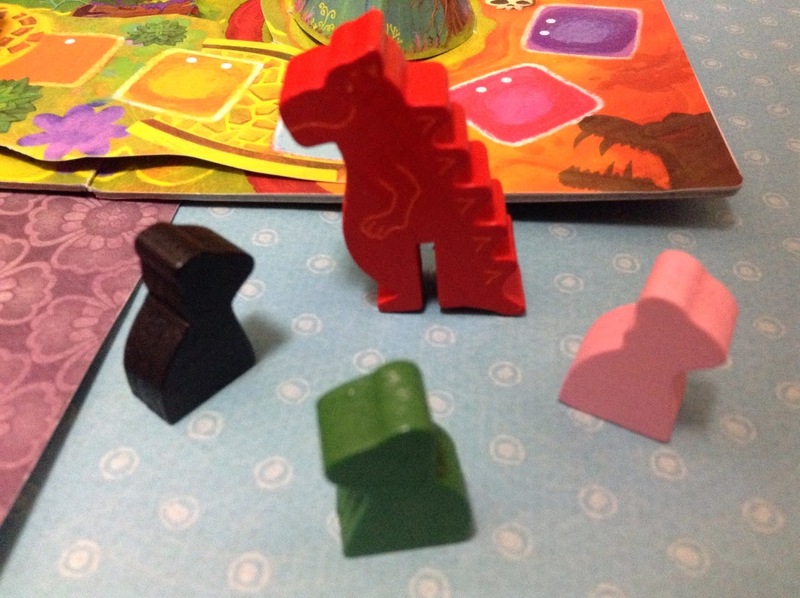 The simplification of this game made it a lot more accessible for me, and to the public. It meant any one could play, those new to board games, those that played a lot of board games, families, children, pretty much everyone. What also sold me on it was that I had a chance of getting this played with other gamers in my group who didn't play a lot of abstract games. 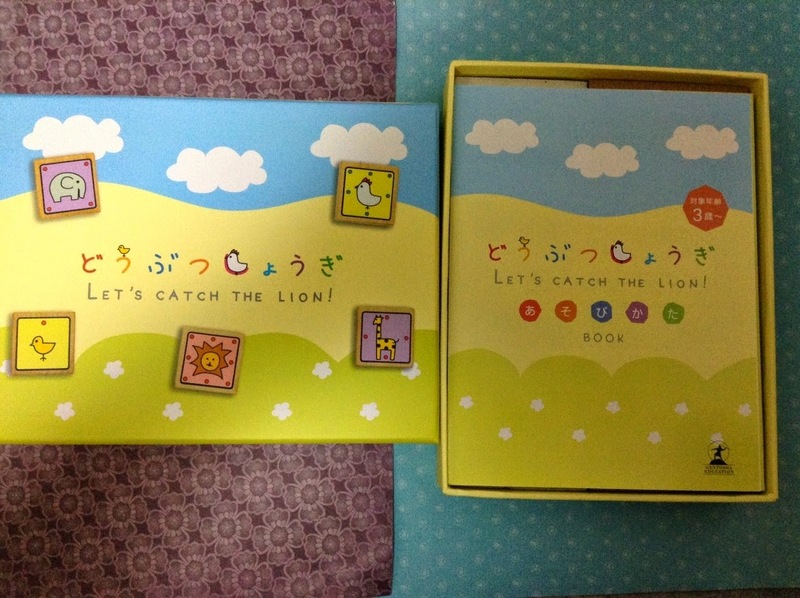 The Japanese version consists of a fold out board, and great looking wooden pieces. The box and everything shouts highly marketable. They did everything right in making this game, and somehow they got it onto the mainsteam market shelves. This game has now been republished in multiple countries around the world. If you ever visit Japan you should be able to still get the Japanese version of Dobutsu Shogi in game stores, and Tokyu Hands, and possibly Yamada Denki. There's now even 2 more versions, I want to get them all! I think definitely I might get Purring Dobtsu Shogi. that features cats and dogs in a 5 x 6 grid. which is a 9 x 9 grid sized board. 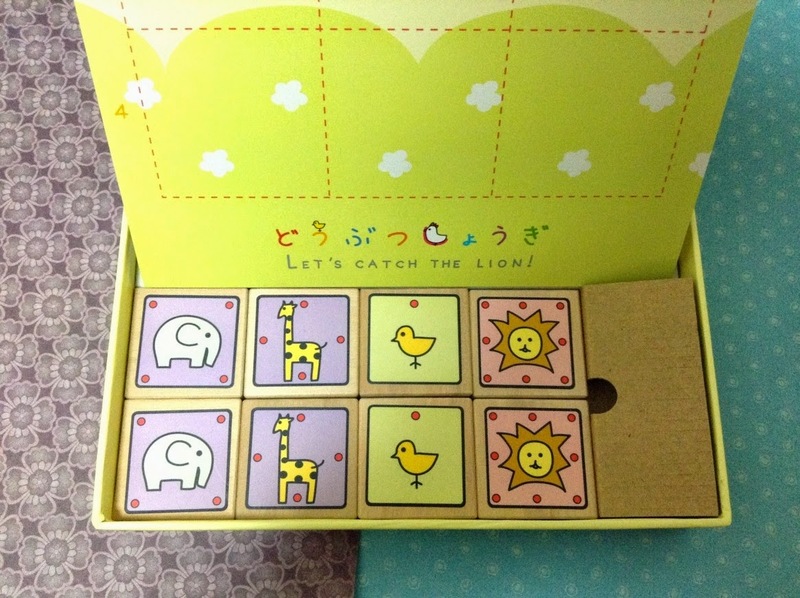 Ooh, you can even buy Dobutsu Shogi bubble gum which look too cute to eat. I'll try to get some of the other Dobutsu Shogi's to show you. Look how awesome this looks!! A couple of months later my friend Dano brought the game to a gaming event he was hosting, and we got to give it a go, and what a blast. Plus the art was amazing! Amazingly cute and beautifully drawn. That was it - my mind was occupied the rest of the day thinking about where I could get the game, and if it was possible for me to get the game on the way home (it was impossible hehe). That game made me buy it after 1 play. I bought it...and then ended up buying about 8 more copies to share with other gamer friends around the world. The way they designed the board was awesome. I wonder who printed the board...or maybe they got a card designer to print the popup section, and they glued it onto the board...or...hehe, these are the thoughts that pop into my head when I see something like this. It's such a fascinating game board. Plus how cute is the dragon that you're meant to be slaying...awh... it reminds me a lot of Mario Brothers. Save the princess from Bowser! I still like this game a lot. It's great with new gamers, and it's something I think I could bring out to play with my hubby (who doesn't play board games unless I beg him hehe) and his friends. This is one of those games I'm keeping in my collection, it's in a small box, is beautiful, and fun. 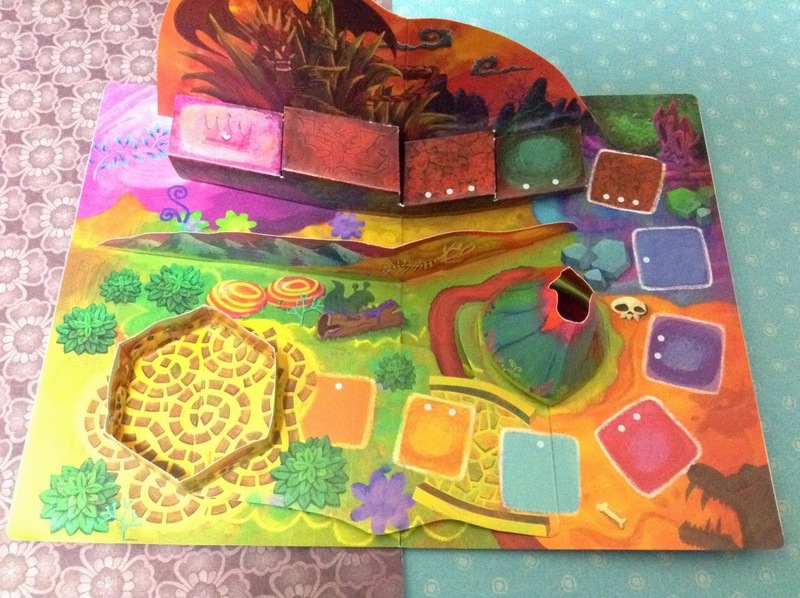 Ooh, if you were creative enough you might be able to give this as someone's gift, and instead of a popup card, you could put a piece of paper/cardboard with a message in the board (not glued in or anything, just loose) so when the person opens the board for the first time..."surprise! Happy Birthday! You get a game and a card!" 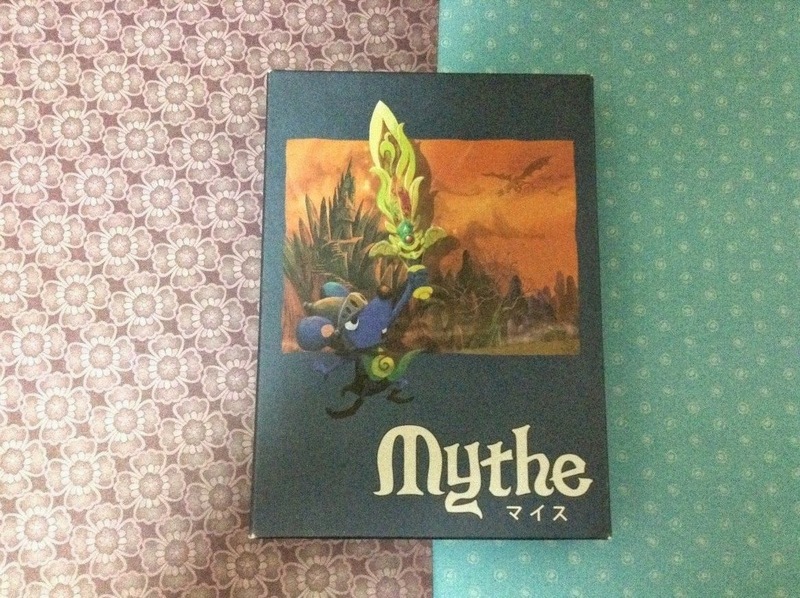 Mythe is published by Sugorokuya and designed by Koji Malta. 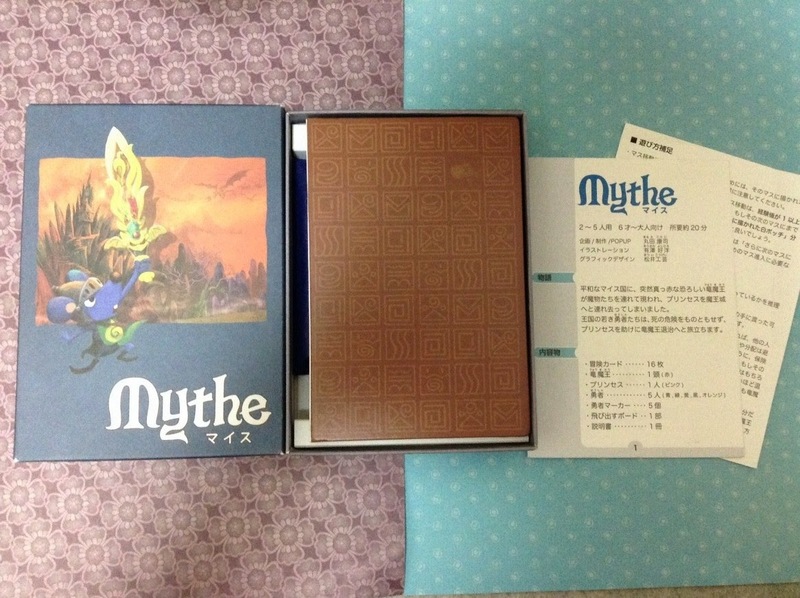 Definitely, go try and pick this up if you get to visit their game store in Koenji Tokyo. I've been looking high and low for it since forever !